Sega just announced a new collaboration with Puella Magi Madoka Magica at the Tokyo Game Show. 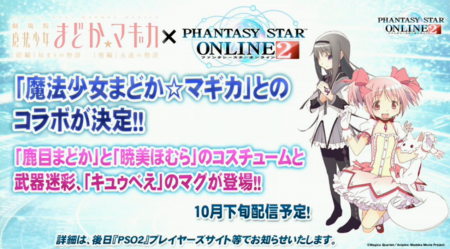 Madoka Kaname and Homura Akemi costumes and weapon camos, and a Kyubey mag will be released sometime late October to Phantasy Star Online 2. The costume will automatically equip their hairstyles too.